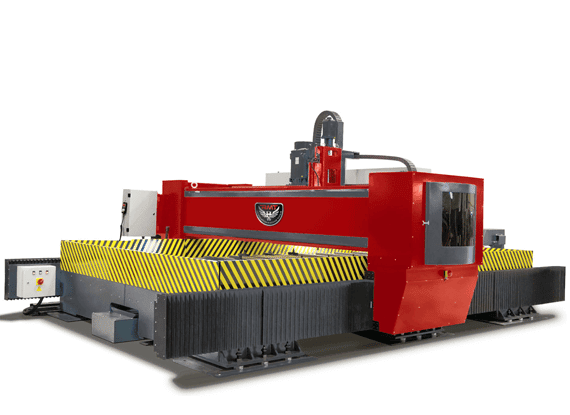 REVOLUTION MACHINE TOOLS (RMT) offers several innovative machines including Fiber Lasers, Press Brakes, Plate Rolls, Ironworkers, Angle Rolls, Shears, Structural Steel Drills, Band Saws, and much more. All RMT product designs are built for durability, precision, repeatability, and speed. RMT’s commitment to service begins with our site assessment consultation. Before we even discuss purchasing equipment we make an assessment of your production area to determine whether the equipment will work well in your manufacturing environment. We look at where the equipment will be placed on the production floor, how it will be brought into the facility, and even ways to make the disposal of scrap and waste easier to remove. there are any electromagnetic or vibration interference issues. We take pleasure in helping our customers be successful. Many of our customers have become lifelong friends which have carried over through several generations. The Pipe Spool Master Series of pipe profiling &amp; facing machines from RMT can give your shop a huge competitive advantage. Complex (J, U, V) Bevels can be done and processed in minutes! Easy to program, small foot print, quality finish and most importantly fast and accurate. Call us today to get more information! RMT KYSON Fiber Lasers are capable of insane cutting speeds on thin sheet metal, yet can still carve through 1″ thick steel plate like a hot knife through butter. Unlike other cutting systems though, Fiber Lasers can also cut reflective metals like aluminum, brass and copper. RMT Press Brakes are a true evolution in machine tool engineering. Years of enhancements and unparalleled attention to detail allow RMT Press Brakes to consistently outperform competitors machines year after year. RMT Four roll plate rolls are more precise, productive, versatile, faster, safer and easier to operate than three roll machines. They are less dependent on operator competence. They are ideal for bending plates up to 6″ thick. The foundation of all RMT Angle Rolls is a solid, industrial strength frame precisely formed and precision welded made from mill-certified, high-yield steel. As a result, RMT Angle Rolls perform accurately and reliably year after year. We are so confident in our frames that we offer a 10-year warranty with our standard machines. RMT band saws are designed for shops who need quality equipment at an affordable price. They are super strong, super reliable, and super accurate. We know saws, and have built our RMT band saw line with our customers in mind. We take pride in not just making top quality equipment, but in truly helping our customers get what they need so they can be even more successful. RMT shears offer fantastic cuts and amazing repeatability whether you are cutting thin or thick material, even in the most difficult conditions. RMT Shears provides high strength, productivity, sensitivity, and safety while lowering your production cost and improving your bottom line. RMT offers a full line of high quality, low maintenance hydraulic ironworking machines, associated tooling, and accessories that are used in the steel fabrication industry. RMT Ironworkers can punch, shear, notch and brake mild steel plate, bar-stock and angle. A wide range of accessories are available to fabricate rod, square stock, sheet metal and pipe. The H-SMART Series Horizontal Press Brakes are optimal for the forming of small parts with a low operation cost. H-SMART horizontal press brakes bends small parts more easily than vertical press brakes. RMT offers many types of hydraulic presses which range from 25 to 4000 Ton, such as workshop presses, C-frame presses, H-frame presses, gantry straightening press. RMT offers portal frame presses which range from 150 to 300 Ton. All RMT dishing presses are equipped with state of the art handling devices for cold and hot manipulation of blanks up to 16 feet diameter and up to 1 inch thickness. RMT Flanging Machines are available with capacities in cold forming ranging from 14 Ga to 1 inch, ASME 2:1 elliptical heads up to 16 feet diameter. The range of special flanging equipment, designed for cone production, has the capability of flanging ends up to 16 feet maximum diameter on the horizontal axis or up to 10 feet length in a tilted position. RMT drilling machines can drill so many holes on a 20 inch drive, that it doesn’t have the need to move the material as often. For example; if the holes 1/2″ and the distances between the holes are 2″, you are able to drill 10 holes without any drive of the profile. That transfers into very big timesaving. The other huge advantage of RMT beam drilling system is the ability to scribe markings on all 3 surfaces. RMT angle punch, cutting and marking machines, provides a brand new production solution to the ones who require a quick but high quality operation without wastage in power or telegraph poles, towers, oil refineries and all steel construction works. RMT angle punching machines designed to be able to punch 2″x2″ to 6″x6″ L angle bars up to 1-1/4″ diameter automatically and to cut them in programmed lengths. 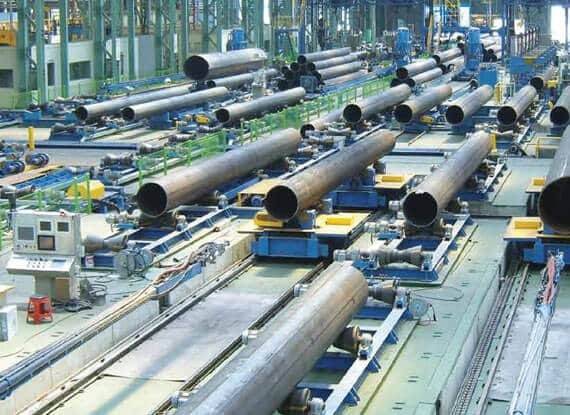 Revolution Machine Tools provides thick walled pipe manufacturing solutions with complete turnkey facilities. RMT are proudly partnered with world leader manufacturer Seokwang Industrial Co., Ltd. located in S.Korea. RMT also specializes in engineering custom machinery. If the current lineup of tooling doesn’t give you the solutions you need, then we’ll analyze your workflow for solutions. We never sacrifice quality so that you can ensure you’re receiving only state-of-the-art machinery. FIBER NATION LASER: RMT KYSON 4 KW IS GREAT! Want to see how fast and accurately our machines can form YOUR part? We can do a demo for you. Simply let us know what you want us to make by filling out this simple request form. INTERESTED IN RECOMMENDING RMT MACHINES TO YOUR CUSTOMERS? Our brand has a solid reputation and is growing by the day. Our customer service and quality machines are selling faster than we can stock them. Talk to us about a partnership today!